Turbulence Ahead: Can Local Government Go Bankrupt? There's a rather gloomy piece in today's Daily Telegraph suggesting that Irish banks are about to go the way of Scandinavian banks in the early 1990s. It wasn't pleasant, in case you were still in nappies back then - think Northern Rock only it's your bank and the crisis lasts nearly ten years. No, I think the people to really feel the pain will be your friendly local government. The chart shows the trend in the value of 'development contributions' paid to local authorities plotted against the trend in house completions. Development contributions are 'levied as a condition of planning permission in accordance with development contribution schemes adopted under the provisions set out in sections 48 and 49 of the Planning and Development Act 2000'. In other words, they are a tax levied by local authorities on builders (and ultimately the buyers of their houses). 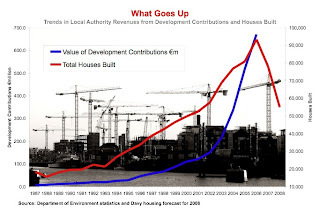 Just look at the trend in their value: back in 1987, Irish builders paid over €6.6 million in contributions to local authorities. 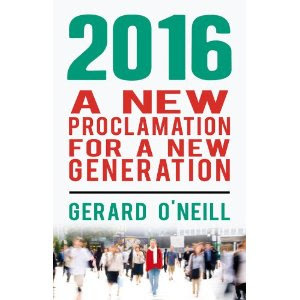 By 2006 the figure had risen to €671 million: that's a 100-fold increase in less than ten years. You can check out the data for yourself in Table 20 of the Department's statistical report here. This additional revenue has been used to fund a range of key public infrastructure such as roads, sewers etc. that are necessary for all housing and commercial construction to proceed and for purposes of specific community benefit (such as recreational areas, parks etc.) as well as for more general purposes supporting economic growth and competitiveness ... According to the National Development Plan it is estimated that €2.1 billion will be collected in development contributions during the lifetime of the plan (2007-2013). I don't think they are going to see €2.1 billion - or anything even close to it over the next five years. So then what will they do? Why it's obvious: they will fight tooth and nail to hold on to every cent of revenue they get from every other source. Hence the outrageous decision to effectively ban private suppliers of waste collection services in Dublin. Dublin's local government bureaucrats have an effective monopoly and like all good monopolists they want to hold on to it and to exploit it as best they can. Tony Soprano would be proud of them. With revenues from development contributions drying up faster than bank credit lines then expect things to get a lot uglier down at your local town hall.